Colour composite image of Centaurus A, revealing the lobes and jets emanating from the active galaxy’s central black hole. The interstellar boundary region shields our solar system from most of the dangerous galactic cosmic radiation that otherwise would enter the solar system from interstellar space. We’re about to get a better grasp of one of the biggest ideas in the universe:inflation. The first maps of the cosmos from the European Space Agency’s Planck satellite are due out in early 2013. They should help us to hone descriptions of how, after the big bang, the universe grew from smaller than a proton into a vast expanse in less than a trillionth of a trillionth of a second. The early universe was a featureless soup of hot plasma that somehow grew into the dense galaxy clusters and cosmic voids we know today. On a large scale, regions far apart from each other should look very different, according to the laws of thermodynamics. But studies of the cosmic microwave background (CMB) – the first light to be released, some 300,000 years after the big bang – show that the universe still looks virtually the same in all directions. The universe went through a traumatic growth spurt before it was a billionth of a billionth of a second old, according to the latest data from the Wilkinson Microwave Anisotropy Probe (WMAP). The probe has also given physicists their first clues about what drove that frantic expansion, and revealed that the cosmic “dark age” before the first stars switched on was twice as long as previously thought. On Thursday, the WMAP team revealed the best map ever drawn of microwaves from the early universe, showing variations in the brightness of radiation from primordial matter. The pattern of these variations fits the predictions of a physical theory called inflation, which suggests that during the first split second of existence the universe expanded incredibly fast. The variations in the density of matter that the microwave map shows up were created by quantum fluctuations during the expansion, according to the theory. If so, then those fluctuations provided the seeds for the gravitational growth of galaxies and stars – without inflation the universe would still be a featureless cloud of gas. Since its launch in 2001, the Wilkinson Microwave Anisotropy Probe (WMAP) space mission has revolutionized our view of the universe, establishing a cosmological model that explains a widely diverse collection of astronomical observations. Led by Johns Hopkins astrophysicist Charles L. Bennett, the WMAP science team has determined, to a high degree of accuracy and precision, not only the age of the universe, but also the density of atoms; the density of all other non-atomic matter; the epoch when the first stars started to shine; the “lumpiness” of the universe, and how that “lumpiness” depends on scale size. In short, when used alone (with no other measurements), WMAP observations have made our knowledge of those six parameters above about 68,000 times more precise, thereby converting cosmology from a field of often wild speculation to a precision science. Now, two years after the probe “retired,” Bennett and the WMAP science team are releasing its final results, based on a full nine years of observations. WMAP’s “baby picture of the universe” maps the afterglow of the hot, young universe at a time when it was only 375,000 years old, when it was a tiny fraction of its current age of 13.77 billion years. The patterns in this baby picture were used to limit what could have possibly happened earlier, and what happened in the billions of year since that early time. The (mis-named) “big bang” framework of cosmology, which posits that the young universe was hot and dense, and has been expanding and cooling ever since, is now solidly supported, according to WMAP. WMAP observations also support an add-on to the big bang framework to account for the earliest moments of the universe. Called “inflation,” the theory says that the universe underwent a dramatic early period of expansion, growing by more than a trillion trillion-fold in less than a trillionth of a trillionth of a second. 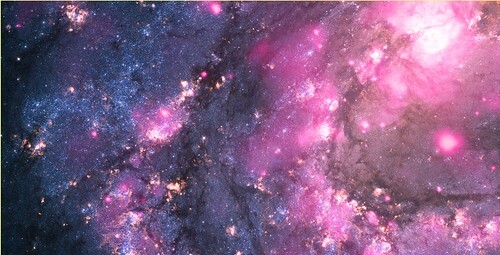 Tiny fluctuations were generated during this expansion that eventually grew to form galaxies. Remarkably, WMAP’s precision measurement of the properties of the fluctuations has confirmed specific predictions of the simplest version of inflation: the fluctuations follow a bell curve with the same properties across the sky, and there are equal numbers of hot and cold spots on the map. WMAP also confirms the predictions that the amplitude of the variations in the density of the universe on big scales should be slightly larger than smaller scales, and that the universe should obey the rules of Euclidean geometry so the sum of the interior angles of a triangle add to 180 degrees. Recently, Stephen Hawking commented in New Scientist that WMAP’s evidence for inflation was the most exciting development in physics during his career. The universe comprises only 4.6 percent atoms. A much greater fraction, 24 percent of the universe, is a different kind of matter that has gravity but does not emit any light — called “dark matter”. The biggest fraction of the current composition of the universe, 71%, is a source of anti-gravity (sometimes called “dark energy”) that is driving an acceleration of the expansion of the universe. WMAP has also provided the timing of epoch when the first stars began to shine, when the universe was about 400 million old. The upcoming James Webb Space Telescope is specifically designed to study that period that has added its signature to the WMAP observations. WMAP launched on June 30, 2001 and maneuvered to its observing station near the “second Lagrange point” of the Earth-Sun system, a million miles from Earth in the direction opposite the sun. From there, WMAP scanned the heavens, mapping out tiny temperature fluctuations across the full sky. The first results were issued in February 2003, with major updates in 2005, 2007, 2009, 2011, and now this final release. The mission was selected by NASA in 1996, the result of an open competition held in 1995. It was confirmed for development in 1997 and was built and ready for launch only four years later, on-schedule and on-budget. 2nd announcement of ESLAB 2013 – The Universe as seen by Planck: An international conference dedicated to an in-depth look at the initial scientific results from the Planck mission. ESA/ESTEC, Noordwijk, The Netherlands, 2-5 April 2013. For more information, please visit http://congrexprojects.com/13a11. (Sen) – Astronomers using the Hubble Space Telescope have discovered a population of six previously unseen galaxies that formed 13 billion years ago. They also refined the distance of a seventh galaxy, identified as UDFj-39546284, as the most distant galaxy on record, which we are seeing as it was when the universe was only 380 million years old, less than 3% of its current age. That is further back in time than any object seen before. The survey of a part of the sky called the Ultra Deep Field (UDF) has given scientists the first robust sample of galaxies that show how abundant they were in the era when galaxies first formed, and support the theory that galaxies assembled continuously over time and could have provided enough radiation to reionize the universe just a few hundred million years after the big bang. (Sen) – The European Space Agency’s Planck telescope has detected a bridge of hot gas connecting a pair of galaxy clusters. It’s the first conclusive detection of hot gas connecting clusters and is measured across a distance of 10 million light years. The finding is important because it shows the ability of Planck to probe galaxy clusters, examining their connection with the gas that permeates the entire Universe and from which all groups of galaxies formed. According to ESA “this marks Planck’s first detection of inter-cluster gas using the SZ effect technique”. The SZ effect technique is named after the scientist Sunyaev–Zel’dovich, who discovered it. If the Cosmic Microwave Background light interacts with the hot gas permeating these huge cosmic structures, its energy distribution is modified in a characteristic way, known as the SZ effect. In the past Planck has used the SZ effect to detect galaxy clusters, but it also provides a way to detect faint filaments of gas that might connect one cluster to another. At the very early stages of the universe, it’s believed that the cosmos was filled with filaments of gaseous matter, with clusters eventually forming in the densest areas. This entry was posted in Astronomy, Constellation, Galaxy, Images, NASA, Photography, Star, Sun and tagged Astrophotography, Cosmology, Star Map. Bookmark the permalink.